After data errors in an EDD have been resolved, the end user can submit the data for loading into an EQuIS database. The Sign and Submit tool was designed to facilitate submitting data to EQuIS Enterprise. This tool requires a user name and password that can be obtained from the EQuIS Enterprise administrator. Note: Before using the Sign and Submit tool, make sure all data files were loaded and that all errors are resolved. 1.In EDP, click the File Tab to view the File menu. 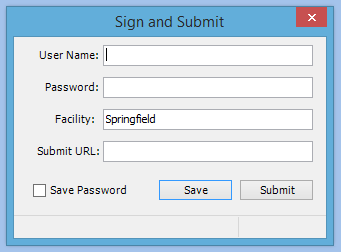 Select Sign & Submit to view the Sign and Submit dialog. 2.Enter the User Name and Password as well as the Facility Code that identifies the planned data facility. The user name and password must exactly match the EQuIS Enterprise user name and password to ensure that a valid user is submitting data to the appropriate facility. In the Submit URL field, enter the URL for the EQuIS Enterprise site that this EDD will be submitted to. Append "edpsubmit.asmx" to the end of the URL. For example: https://www.testsite.com/equis/edpsubmit.asmx. Note: The Facility Code is extremely important when submitting Enterprise Data, however, it is possible to modify the data entered into the Facility section of the Sign and Submit tool, as needed. 3.Click Submit. A Save Data File As window opens that allows browsing to the location where the file will be saved to. Note: The Sign and Submit feature can save a compressed file whose name consists of CurrentDate.FacilityCode.FormatFileName.zip (e.g., "20070711.Springfield.EFWEDD.zip"). The contents of the compressed file include text files named for the sections of the format file used to create them. 4.After you choose a location to save your file to, click Save. Once the zipped EDD package is saved, a confirmation EDD Signed and Submitted window is displayed. After creating the compressed file, the EDD Package is ready to be loaded into EQuIS Enterprise EDP. Submit the file via email or web upload, as instructed by an EQuIS Enterprise administrator.